Football Frenzy Video Slot Guide & Review - Casino Answers! Football Frenzy is a 5-reel, 25-line video slot developed by Cryptologic, featuring wild substitutes and a free spins bonus game. You can play the Football Frenzy video slot at InterCasino and Casino Joy. Before you start playing Football Frenzy, you must choose a team. Your choices are England, France, Germany, Italy, Netherlands, Spain, Argentina and Brazil. You can always go back and change your team if you want. The default wagering settings are $0.05 per line at 25 paylines, but you can change the paylines anywhere from 1 to 25 and bet to $0.01, $0.02, $0.03, $0.04, $0.10, $0.15, $0.20, $0.25, $0.50, $0.75, $1 and every dollar up to $20. You can make a bet as small as a penny or as large as $500 per spin on Football Frenzy. You can adjust the game speed from Normal to Fast or to Very Fast. When you have made up your mind on how much you wish to wager per spin, hit the “Spin” button to play or use “Bet Max” to play all 25 paylines. The Football Trophy symbol is Football Frenzy’s top fixed jackpot at 2000 coins. The Football Fans symbol is worth 1000 coins, which is the next best thing. This is not a very strong jackpot, although we will get to the best way to win big on the Football Frenzy slot game below. The wild symbol on the Football Frenzy video slot is the Football Frenzy logo. It will only substitute for other symbols to complete a winning combination if it appears on the second, third, fourth or fifth reels. It will not substitute for the Scattered Football symbol. It does not pay out by itself. To play autoplay spins on the Football Frenzy video slot, you can quickly set the number of autoplay spins in the lower left section of the screen, followed by the “Play” button to start autoplay spins, or you can open up the advanced settings. In the advanced settings, you can play up to 999 autoplay spins, stop on a cumulative win or loss of up to $5,000 or a single win of up to $5,000. You can stop the autoplay spins at any time. Payouts are displayed on the Paytable. Payline wins are multiplied by the amount bet per line. The highest win amount is paid on each active payline. Scatter wins are multiplied by the total bet and added to payline wins. Feature wins are added to scatter and payline wins. Winning combinations pay from left to right. The Football Frenzy logo substitutes for all symbols except for the bonus symbol. The bonus symbol appears on reels 1, 3 and 5. Football Frenzy is a great video slot for all of the football fans out there. While it doesn’t have the most special features and the top fixed jackpot is nothing to write home about, the Free Kick Frenzy bonus feature isn’t at all hard to get and will provide you with some big winnings more often than not. From our personal experience, we won at least $150 every time and we must have triggered it close to 10 times. To play the Football Frenzy video slot, visit and get a 100% up to $225 signup bonus, visit InterCasino! Are USA slots players able to play the Football Frenzy video slot? Unfortunately, online casino players based in the United States of America are not permitted to play at InterCasino. 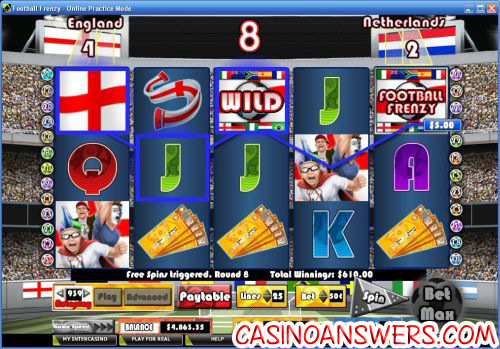 Fortunately, they have other options such as the very US-friendly This is Vegas Casino, where you can find another soccer-themed video slot, Global Cup Soccer. 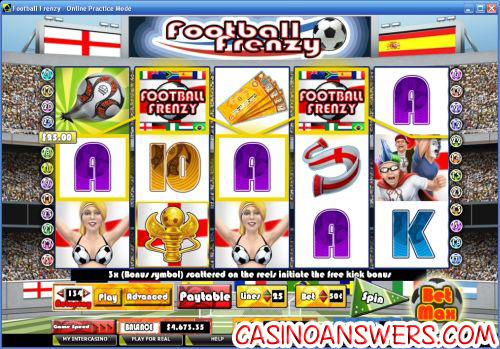 How can Macintosh casino players play Football Frenzy? If you’re a Mac user, there’s a way for you to play Football Frenzy too! You can use the Instant Play flash casino feature at InterCasino. This is an option for Windows players who don’t want to download the casino (even though it will not harm your computer). If you experience any problems trying to play the Football Frenzy slot game, make sure you have the latest version of Adobe Flash Player installed. Does Football Frenzy have a progressive jackpot? Football Frenzy does not have a progressive jackpot and only has a top fixed jackpot of 2000 coins. For a progressive jackpot and a higher top fixed jackpot, play the World-Cup Soccer Spins slot machine at the US-friendly Juicy Stakes Casino. What football slot machines are there?